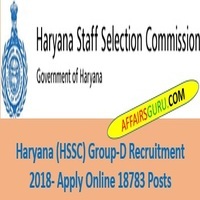 Haryana Staff Selection Board (HSSC) has released a notification for filling the total number 18783 of posts for group d. Aspirants can apply start online from 29th August 2018. Before filling application form, read all the eligibility criteria. Latest News : Opening of HSSC Group D Application form will start from 29th August and need to fill before 18th Sep 2018 (extended to 24th Sep 2018). Check the Haryana (HSCC) Group D Important Dates below in tabulated format. i. Matriculation from a recognized board. ii. Hindi/Sanskrit upto Matriculation, as one of the subject. Interested candidates can follow the below steps in a sequence for applying the Haryana Staff Selection Commission (HSCC) Group D recruitment. Step 1 : Candidates can visit to the official website of HSSC. Step 2 : Now choose the direct link of HSSC Group D Recruitment 2018 option. Step 3 : Candidates can also download the hssc group d official notification. Step 4 : Fill all the required information in the application form. Step 5 : Upload passport sized photograph and signature in a prescribed format. Step 6 : Submitted the application form after verifying all details. Step 7 : Pays the application fees if needed as per gender and category/state. Finally your online application status will be completed. Haryana Staff Selection Commission Board will recruit the candidates based on the marks obtained in written exam, skill test, higher qualification marks and 10% weight rule. The process or procedure to select a candidates are given below in level. The written exam is comprise of two parts. 1st part is of 90 marks and second part is of only 10 marks. In first part of written exam, topics will be as following given below. Please intimate that dependent of Servicemen (Army) may avail any type of relaxation in this process. Mukesh, General category Candidate of other state can fill it. What s the SSC department code? Chandan ji, SSC department code already mention hai in the article. What happen if i upload photo without date. And name in hssc form.will my form be accepted or not?? There is no problem if you upload the photo without date also.